One App for all messaging services. 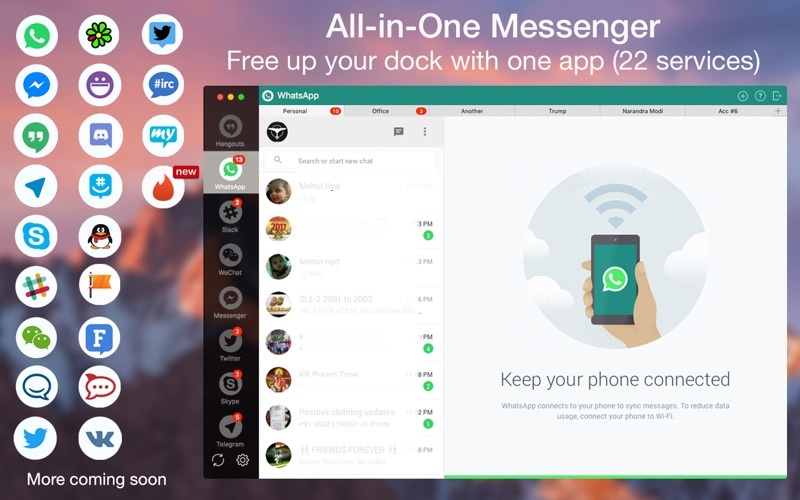 WhatsApp, Facebook Messenger, Hangouts, Telegram, Skype, Slack, WeChat, Twitter, YahooChat, ICQ chat, HipChat, Discord, GroupMe, QQ, Facebook Page messenger VK, Fleep, RocketChat, MySMS, IRC Chat, TweetDeck Tinder. 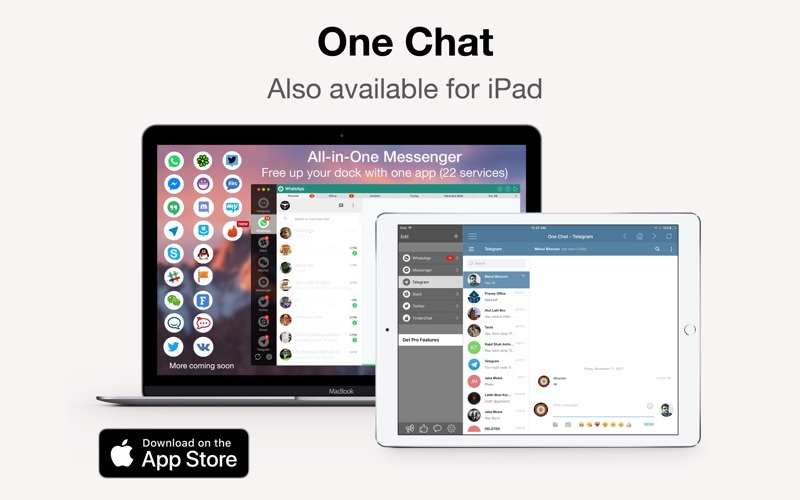 Note: One Chat is a wrapper app, combining all the messaging services. Experience will be 100% similar to web extension of those services, which extra features as follows. ▸ QQ & WeChat only works for old users of them. ▸ Schedule message to send them at a planned time. ▸ Use Multiple parallel accounts of the same service. 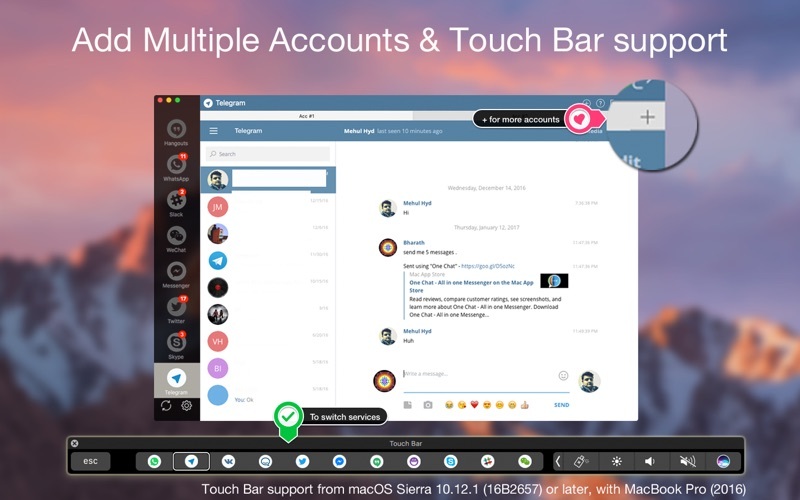 ▸ Touch Bar support in 10.12 to select messaging services. ▸ Remember passwords for easy login. ▸ Get respective Notifications alerts and reply from the same. 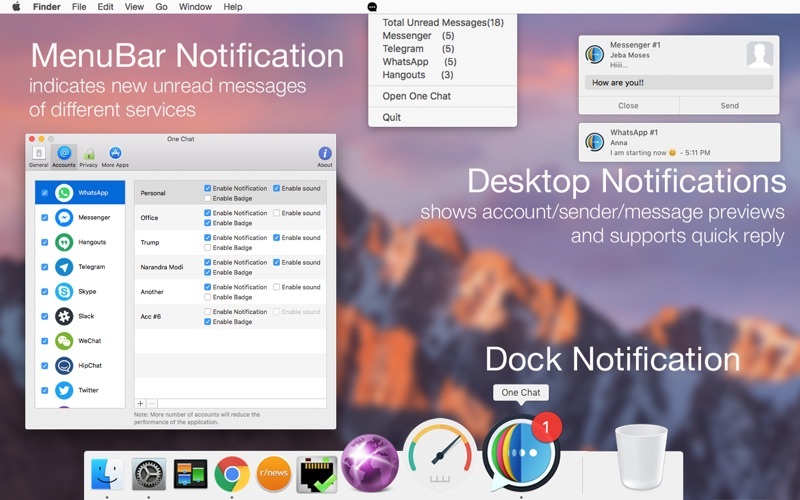 ▸ Mark all unread messages read with just one Click. ▸ Privacy mode to protect your messaging data with touch ID. ▸ Customize messaging service order in the side menu. 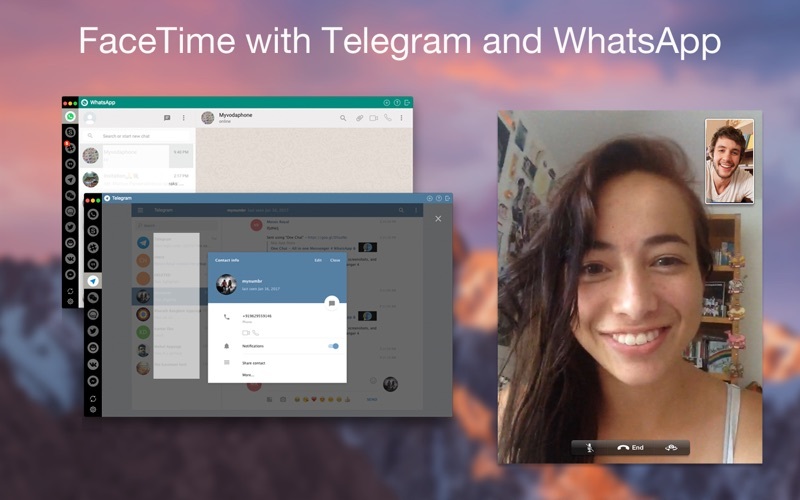 ▸ FaceTime calling from WhatsApp & Telegram numbers. ▸ Customize notification as per your requirement. ▸ Shows notifications badges for individual services. ▸ Check if there are any unread messages, right in the menu bar. ▸ Go Full-screen! Chat with your friends, distraction-free in the full-screen mode. ▸ Lightweight all, with minimum installation size. – More chat services, suggestions most welcome. One Chat is a third party App. The developer of this software is not affiliated with WhatsApp Inc. Facebook Inc. Telegram Inc. Slack Inc. Skype Inc. Google Inc. Atlassian Inc. Tencent Inc. Twitter Inc. V Kontakte. Yahoo Inc. Sleep Inc. Fleep Inc, RocketChat Inc., MySMS Inc, Tinder Inc., in any way.